One of the most problematic areas for kettlebell lifters with chronic shoulder issues is the rotator cuff group. This group composed of four muscles (Supraspinatus, Infraspinatus, Teres Minor, Subscapularis) has the important task of keeping the head of the humerus in contact with the glenoid fossa of the scapula for a smooth and effective motion. Not an easy job considering the shoulder joint is one of most the mobile in our bodies, and thus, one of the more unstable. Kettlebells have been blamed for many rotator cuff issues or are viewed as the sure way to exacerbate any shoulder condition. Truth is, people have suffered rotator cuff injuries before kettlebells became popular or develop rotator cuff issues without even touching a kettlebell. Let’s keep in mind the number of rotator cuff issues resulting from participating in sports far exceeds the incidences allegedly caused by kettlebell lifting. Technique This one is without a doubt, one of the major reasons. It does not matter how strong or healthy your shoulders are. If you execute kettlebell lifting with poor form, you are inviting rotator cuff injuries to slow you down. Don’t forget how the shape of the kettlebell increases the force requirements in our joints to manage the load. Rotator cuff injuries as a result of sloppy form is not only a problem in the kettlebell world. Sloppy form in Olympic Weightlifting, swimming, throwing, and even boxing, will injure the rotator cuff. Work on your form and do not be hasty. If in doubt, seek the services of a coach or get more information products on the subject. Lack of strategy Which can be easily summarized as “too much too soon, too far too early“. How many of us in our excitement have been guilty of this? I can definitely speak from experience after giving in to excitement a couple of times and throwing off my guidelines. I’m grateful I suffered only minor incidents but I learned my lesson and embraced the importance of planning more than ever. Make sure to sit down and put a plan together or hire a qualified fitness professional to help you, and follow your plan. Avoid the mistake of increasing the weight excessively within a couple of sessions or worse yet, during the same session. If your range of motion is limited, don’t get frustrated and try to get to picture perfect limberness in only a few days. As you get stronger, your body will allow you to go further. Again, planning your training so you can increase your loads and range of motion within a reasonable time frame is essential and an excellent investment of time. Structural Issues Many kettlebell lifters deal with innate or acquired structural conditions which have a significant impact on rotoator cuff health. 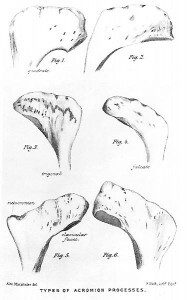 Take for instance, the shape of the acromion and coracoid processes of the scapula which favor extra range of motion in some while restricting it in others. Consider the soft tissue restrictions resulting from favoring certain postural patterns. Those with excessively rounded shoulders and “hunchbacks” are the most popular examples of what postural adaptations can do to the healthy body. This kind of “upper cross” posture will cause the surrounding musculature to shorten in some areas and resist elongation in other areas, creating a state of uncomfortable hypertonicity. This posture also protracts (pulls away) and upwardly rotates the scapulae and since scapular position is crucial for shoulder movement, you bet the range of motion of the kettlebell lifter featuring these traits will be restricted. It is hard to distinguish what is attributed to innate factors and what to postural adaptations without proper and extensive training so make sure to consult a qualified professional should you have doubts. Just like in any other activity, proper training and skill development are crucial to keep the lifter safe and the rotator cuff healthy. Kettlebell training can actually be your ally in developing stronger shoulders, including rotator cuff muscles, when you take the time to master the techniques, progress accordingly, and respect what your body tells you. See you on the exercise floor!